I wanted to check if it's possible to use emoji in a password for my Account on OS Yosemite. It worked but I didn't realize that the login screen has only native keyboards, so I can't type emoji there. So the situation is that I know my password but I can't type it. The machine has rebooted to the Recovery HD and I don't see a way to enable the emoji keyboard there. In effect, since FileVault was turned on, I can't restore the password easily. Find a way to type emoji in the password field, this would be ideal. Restore the password even though I used FileVault. If you have "Other Input Sources" available at the top right of your login screen, select the one called Unicode Hex Input. This can be used to input emoji (or any other character) into the password field, as long as you know the Unicode Hex number of the character. This number can be found in the Character Viewer or on the internet. Some items you find in the "emoji" category have Unicode hex numbers with just 4 characters, such as Airplane U+2708 ✈. With the Unicode Hex Input keyboard, you input this by holding down the Option key while you type 2708. Other emoji have Unicode hex numbers with 5 characters, such as Grinning Face U+1F600 😀. For these you need to find the two corresponding UTF-16 Hex codes (sometimes called "surrogates") by consulting Character Viewer or using an internet source like fileformat.info. For 1F600 these are D83D and DE00. You can input 1F600 by holding down the option key while typing D83DDE00. You may see two dots in the field, but it is still just one character. Install OS X on an external drive from Recovery mode (Cmd + R while starting). Boot from the external drive. Install the Hex/Emoji keyboard to be able to type the relevant character. Go to Disk Utility, choose the locked disk. Go to File -> Turn Off Encryption. Enter your password here and leave it for couple of hours, since the decryption is going to take a while and there is no indication of progress. Restart in Recovery mode again. Go to terminal and run resetpassword. Choose your disk and create a new password for your user. Restart and use your brand new password to login. Since you have Filevault - that makes your situation precarious and a bit delicate. Some good news, Apple has disabled emoji entry in the password pane for 10.11 El Capitan - I can't paste or get emoji in the Users & Groups preference pane. Apple's official manner to get past this is to click the ? in the password field and reset your password. If you used a recovery key - you can enter it without needing emoji keys. If you used AppleID, you can enter that without needing emoji. Barring that, If you have a current backup (or can let things complete if you are logged in), the fastest way froward is to wipe the Mac and then restore the backup. You can choose a new password for a new admin account and then import the user files. 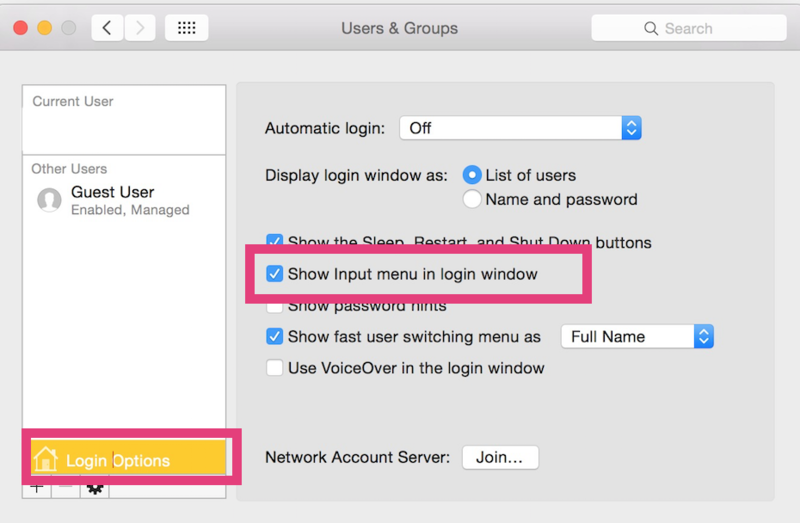 If you have ssh enabled, or remote desktop enabled, and the Mac is still logged in to your account, you could log in to the Mac from another Mac over the network. This will not work if you have rebooted the Mac and Recovery HD boot is waiting at the Filevault unlock screen. 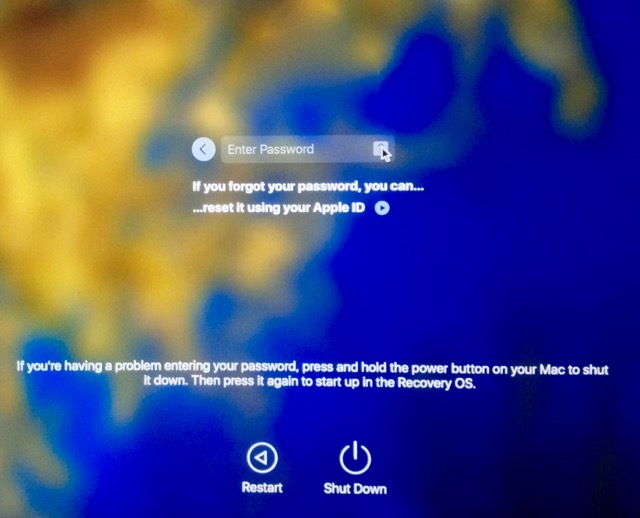 If you have a second admin account that is FileVault enabled, you could reboot and use that password to unlock the disk and then reset the password on your main account. Lastly, you could boot to recovery HD or internet recovery and reinstall the OS to a USB drive. Then you can mount the file vault drive and have emoji to unlock the volume and make a new admin account through various tricks / procedures similar to using single user mode to remove the .AppleSetupDone file. Adding to bmike's answer, if you can't do any of that, and don't have a recent backup, you might try connecting the disk to another computer, and mounting the volume to save your files. You can apparently do it with both mac, windows and linux. You could use ssh, telnet, vnc/rdp, Back To My Mac or similar methods, provided they are enabled and/or available. You will be prompted to enter your problematic password. Hitting ⌃+⌘+space will open a unicode tool to assist you with entering the emoji character(s). If successful you will be granted the opportunity to enter a new password. Type the new password a second time (to verify) and that ought to do the trick. This is to go with @TomGewecke answer. If you are seeing the input menu at the top right hand corner of the login screen. This may only be because their is another user logged in. ( Fast user Switching). If there is a user already logged in, the input menu will always show even if no users have it enabled to show in their menu bar. But if there are no users already logged in then you will not get the menu, unless you have enabled the input menu to show in the login window before. Check Show Input menu in login window. click the Input menu (shows the name of the currently selected input source next to a keyboard icon) in the upper-right corner of the screen, then select the desired input source or keyboard layout. If you don't see the input source you are looking for, move the pointer over Other Input Sources, then select the input source from the complete list that appears. Even if you're locked out, you should still have access to the Accessibility Settings part of your System Preferences, in which case you can proceed to Keyboard Preferences and adjust your peripheral input sources. This means you can add/enable "Unicode Hex Input". Plus, checking "☑︎ Show Input menu in menu bar" will allow you to "⌨ Show Character Viewer" and inject a variety of Unicode & Emoji characters. I am not a Mac user so this may be nonsense. However since the situation is desperate, I'll offer it anyway. You can use the utility in OS X to generate many Unicode characters by manually inputting the hexadecimal code. Other options include saving word processor files as Unicode or UTF text. Make sure you have activated the Unicode Hex Input keyboard. See the activate keyboards section for more details. Open an application which supports Unicode HexInput such as TextEdit. TextEdit is installed with OS X and can be opened from the Dock or the Applications folder. Switch keyboards to the Unicode Hex Input from the flag icon dropdown menu on the upper right. If the Unicode Hex Option is grayed out, then you are in an application which does not support this utility. Note: Most current applications support this keyboard, but some old versions of software may not. To input a specific character, hold down the option key, then type in the four-digit hexadecimal Unicode value (e.g. 044D = Cyrillic э). Charts listing Unicode values for different scripts are available at www.unicode.org/charts. Not the answer you're looking for? Browse other questions tagged yosemite keyboard password filevault emoji . How do I mount my FileVault 2-encrypted volume? Does Windows or Linux have any tools for accessing a FileVault2 encrypted drive's contents? 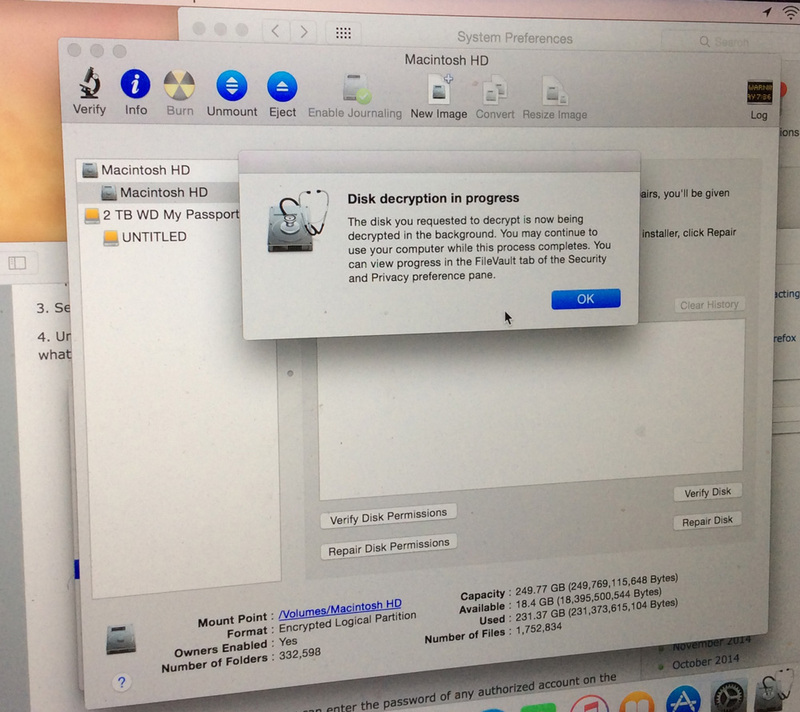 Is there a way to recover a disk when FileVault is used?